Pruritus: Who's itching for it? Pruritus: Who’s itching for it? Scratching is a reflex which is supposed to smother annoying itching with pain production. For a long time research has therefore been seeking out alternatives to acts of self-injury in the battle with acute and chronic pruritus. The suffering and the impact on their quality of life is reminiscent of those of chronic pain patients. Max von Frey, Austrian-German physiologist who taught in the late 19th century in Würzburg and Zurich, characterised itching as being the “little brother of pain.” Eight to nine percent of the population according to a random sampling carried out suffers from acute itching. With chronic itching the number is probably even higher and in Germany is around thirteen percent. There is however much less discourse about itching compared to the amount of research on and treatment of pain. It still remains the case that the treatment options for this undesirable skin irritation are very limited. Not infrequently the need to scratch and act of scratching creates more damage than the cause of the itching itself. This “scratch threshold” however exists at quite different levels for different patients and also depends on the cause of the irritation. The suffering involved is nonetheless often enormous. Mood swings and problems with initiating and maintaining sleep often occur as the consequences and side effects of chronic pruritus. Yet even if no specific active ingredients exist – aside from antihistamines for allergy-related skin irritations – neurologists in particular have in recent years found a number of typical characteristics in the physiological forwarding and processing of and sensitisation involved in itching. To some extent the mechanisms and committed nerve paths are quite similar to those of pain, but also partly specific to itching. Anybody who tries to get to the base cause of itching comes across four typical groups of triggers: dermatological disorders, systemic diseases, neuropathological and psychogenic aberrations are most often the cause of disturbed nervous stimuli processes. 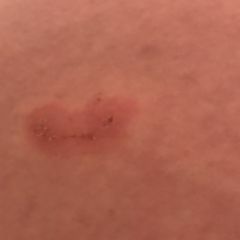 A direct link to itching occurs for instance with atopic eczema, and four out of five patients with psoriasis know this itching only too well. 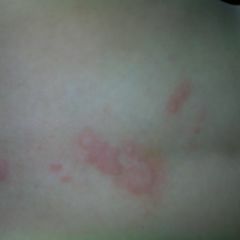 Annoying continual itching is however also felt by people with chronic renal failure. 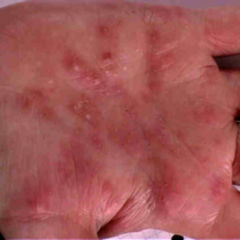 With Hodgkin’s disease such irritation is often the first sign of the disease. 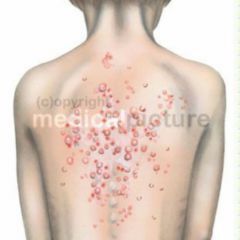 With neuropathological conditions such as multiple sclerosis or post-herpetic neuralgia, pruritus belongs to the list of the symptoms. Delusions about one’s body, such as the urge to constantly clean one’s body of bugs and pests, are often associated with a permanent itch. Receptors are potential targets for inhibitors which are involved in the periphery rather than the central nervous system in the transmission process. Mrgpr receptors (mas-related G-protein coupled receptor) play a somewhat major role in histamine independent itching receptors. Interestingly, MrgprA3 is, as a receptor for the malarial agents chloroquine, at the same time known for having annoying itching as a side effect. Itching which is resistant to antihistamines can also be initiated through a number of other endogenous agonists, such as endothelin-1, ß-alanine or serotonin. For all these pruritogenics there are specific receptors – possible targets of a future anti-itch medium. One of the better known pruritogenics is capsaicin, the active ingredient that gives peppers their sharpness. At higher concentrations the burning deletes itching, nevertheless ion channels are opened as well, particularly in neurons which respond to histamine. However this is only true in a limited sense: not all histamine-sensitive nerve fibres respond to capsaicin. Among the “everyday” substances which trigger itching in sensitive patients there are numerous medications: several antibiotics, antidepressants, high blood pressure or epileptic seizure treatment remedies. “It’s all there, all the things which we prescribed in daily practice, and all of them can induce pruritus”, according to Matthias Möhrenschlager from the alpine clinic Davos. By way of example using the cytokine TSLP (thymic stromal lymphopoetin), Sarah Wilson and her colleagues from Berkeley (USA) describe in last Autumn’s edition of the prestigious journal Cell how the inflammatory process in atopic dermatitis progresses. “Atopic march” often leads to asthma and allergic rhinitis. TSLP is found in the keratinocytes of atopic patients but also in epithelial cells of asthmatics. For example, if keratinocytes of the skin secrete TSLP, this factor can directly stimulate specific sensory neurons, which further conduct the stimulus to dorsal root ganglia for processing in the CNS. There, they trigger the scratching, which in turn injures the epidermis and releases more TSLP. The cytokine stimulates not only neurons, but also lymphoid cells. Other cytokines such as IL-5 and IL-13 recruit eosinophilic granulocytes, thus ensuring a massive scale inflammatory response. Pain and itching are closely related. Pain attenuates and superimposes itself on itching. Whoever tries however to treat a pain with opiates ends up under certain circumstances right back at the starting point. Morphine does indeed suppress the pain but promotes itching. 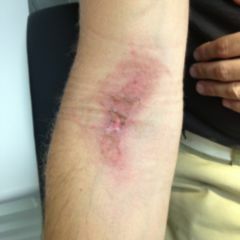 Opiate agonists are nevertheless also on the list of treatments for pruritus, especially for patients with systemic diseases such as those with renal insufficiency. In many cases gabapentin and pregabalin help against neuropathological itch sensations. Updated guidelines for diagnosis and treatment of itching appeared two years ago in the journal “Acta Dermato-Venereologica” in a collaboration involving the European Academy of Dermatology and Venereology together with the European Dermatology Forum. It was stated: “The guidelines address a symptom, not a disease. As a result of the variety of underlying diseases, we are unable to recommend any singular therapy concept”. There are still barely any good meaningful studies on itching as a topic – quite in contrast to pain research. “Pain’s little brother” shares many characteristics with his bigger sibling, but also has many peculiarities which ought to make individual treatment possible.